Like a heavyweight fighter who hasn’t stepped into the ring for years and ends up on the end of an almighty pummeling after just a few days of sparring, McIlroy’s round was a comedy of silly mistakes, carelessness and pure, competitive rust. Not even the player himself could work out why he hit the pin seeking, suicidal shot to the 12th that led to the double bogey that killed his Open Championship dream. Forget that his 79 wasn’t even enough to beat a retired Nick Faldo, never mind the rest of the field. No luck. Rory McIlroy misses another putt. Picture Eoin Clarke www.golffile.ie:It’s not that he swung the club horrendously poorly but that he didn’t appear to make even one good decision. What was really disturbing about McIlroy’s latest “meltdown” was his lack of answers and they way he was left standing on a dais for eight minutes afterwards, swinging in the breeze, without the merciful hand of a management figure to drag him away from the cold stare of the a press corp that appeared reluctant to intrude too much on some very public grief. It’s to McIlroy’s credit that he spoke at all but given that most of his ills appear to be self-inflicted, it was probably fair that he made an appearance. “I felt like I got off to a decent start,” McIlroy said of his sand save par at the first and missed birdie chances inside 15 feet at the second and third. Then came back to back three putt bogeys. The first from inside 30 feet at the fourth, the next from just off the green at the par-five fifth. After a birdie two at the seventh, he was just one over par yet one always sensed that he was merely going through the motions, tentatively prodding his way around a course that was as frazzled as his brain. Short sided over the back of the ninth, he failed to make birdie there and then frittered the 142nd Open away in the space of three holes with a sloppy bogey at the 10th, a careless three putt at the 11th and that brainless double bogey at the 12th. A birdie two at the 13th was just a blip. Short of the 15th in two, he managed to knock an 80 foot lag putt through the green and into a bunker 100 feet away. Double bogey. A bunkered tee shot at the 17th left to another dropped shot before the inevitable bogey at the 18th where he missed the fairway and the green. Rory McIlroy and caddie JP Fitzgerald. Picture Eoin Clarke www.golffile.ie:“Gave myself a couple of chances early on, made a couple of silly mental errors on 4 and 5, dropped shots there. Made a great 2 on 7 to get it back, had a chance to get it back to even par on 9. And then, yeah, the start of the back nine obviously wasn’t very good. I mean, I hit it in the right rough on 10, which is fine; I made bogey. And then 11, you know, another three-putt there. A stupid mental error, hitting it so far past. And then going left of the pin on 12. When I had no right to be going anywhere near that pin. And then, yeah, it just sort of got away if me. “It’s strange, I mean, I wish I could stand up here and tell you guys what’s wrong or what I need to do to make it right, because I feel like I’ve got the shots, it’s just a matter of going through the right thought process to hit them and that’s something that I obviously haven’t been doing recently. There’s no doubt that Dr Bob Rotella, the mental coach that helped Padraig Harrington become a three-time major champion, would love the chance to work with McIlroy. “I know I have the shots and I know I’m capable of hitting them. It’s a matter of, like I said, being in the right place mentally to do it. Is he thinking about other things, such as his second management split inside two years? Perhaps, but not on the course. “I’m definitely under-thinking on the golf course, maybe over-thinking it off of it,” he said. Having played the course six times in 10 days - 108 holes of on-course preparation - McIlroy was not lacking in practice time. And yet he has played just a handful of rounds over the past month. Since June 13 he has played seven rounds - 73 70 75 76 74 72 79 - averaging 74.14. That’s a lot of drawing boards. 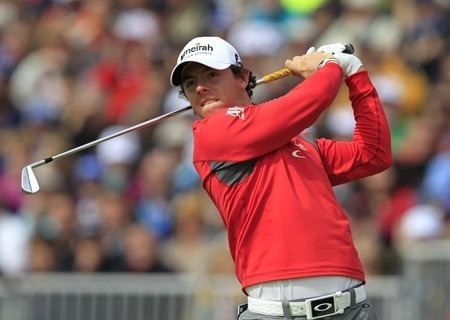 Young gun Rory McIlroy survived a spaghetti western day to keep his Open dream alive at sun-kissed Turnberry. The Holywood ace hit a one under par 69 that he described as a mixture of “a bit of good, a bit of bad and a bit of ugly” to trail leader Miguel Angel Jimenez by five shots. And he could thank coach Michael Bannon for finding his ball on the eighth when he it looked as if he could rack up a cricket score. Rory McIlroy began his comeback on the 16th. Photo Eoin Clarke/www.golffile.ieRory McIlroy could have put a fan in hospital with a wild drive but instead put him up in a local hotel. 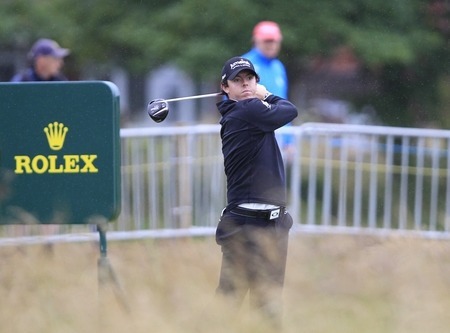 Rory McIlroy was undone by the bunkers at Royal Lytham. Photo Eoin Clarke/www.golffile.ieRory McIlroy was undone by the riddle of the sands at Royal Lytham, dropping six shots with visits to five bunkers in a second round 75 that left him 12 shots behind leader Brandt Snedeker on two over.